NEW YORK, NY--(Marketwired - Nov 24, 2014) - Ghost Stories Live 2014 -- Coldplay's new concert film and live album -- is available now at music retailers everywhere. Filmed by GRAMMY®-nominated director Paul Dugdale, the Ghost Stories Live 2014 film documents the band's unique performance of its latest No. 1 album, Ghost Stories, to a small group of fans in March 2014, two months prior to the album's release. 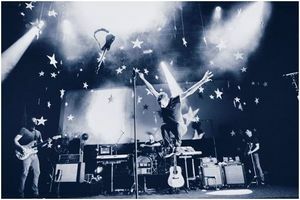 Shot in a custom-built amphitheatre at Sony Studios, Los Angeles, the groundbreaking production sets Coldplay's performance against stunning 360-degree and overhead imagery. It is the band's first DVD release since the GRAMMY-nominated Live 2012 concert film. Parts of the performance were first broadcast in May 2014 as a Coldplay TV special by major broadcasters around the world, including NBC in the US and Sky Arts in the UK, where the film has already been nominated for Best Live Coverage at this year's UK Music Video Awards. But Ghost Stories Live 2014 is the first time that the performance has been sequenced as originally conceived: a visual representation of the Ghost Stories album. The release also contains an exclusive Ghost Stories live album, with audio recorded at shows the band played in London, Sydney, Paris, Cologne, New York and Los Angeles between April and July 2014. The package is completed by eight music videos from the Ghost Stories era, including two never-before-seen films for B-sides "All Your Friends" and "Ghost Story" plus the exclusive Extended Director's Cut of the "Magic" video, which features a brand new cameo by Peter Fonda. Fans can view the trailer for Ghost Stories Live 2014 at Coldplay.com, where the release can also be purchased.